This is a snippet taken form a full CML Pro dossier. 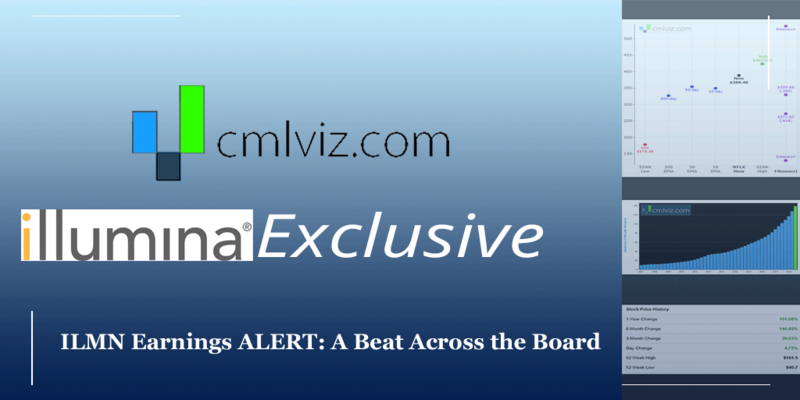 Spotlight Top Pick Illumina (ILMN) reported earnings after the bell, and it was a beat and a raise across the board. We added Illumina to Top Picks on 6-Apr-16 for $168.36. The stock is trading at $313.80, up 86.4% as of this writing. Here are the estimates and the actual results for the marvel that is Illumina. Illumina reported $1.52 in adjusted EPS, which not only beat the consensus average estimate of $1.26, but blew through the highest estimate of any analyst, which was $1.40. Further, Illumina reported $853 million in sales, beating the average estimate $828 million forecast and also smashing through even the highest estimate of $842.50 million. Illumina crushed guidance as well, forecasting $5.70-$5.75 in adjusted EPS, compared with the average estimate of $5.42, and falling just shy of the highest full year estimate, which came in at $5.79. If you want to win, you need to have the right data, at the right time, and it needs to be accurate.